Protect your little one’s sensitive skin from diaper rash. 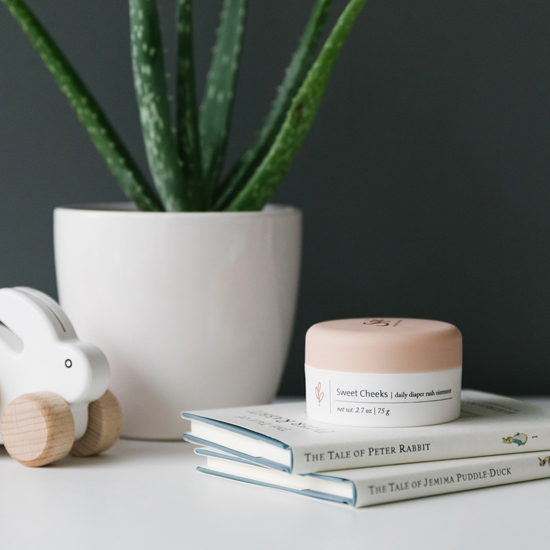 Moisturizing shea butter, soothing olive oil, hydrating beeswax and protective zinc oxide create a barrier to prevent minor skin irritations and relieve discomfort caused by chafing. SKU: 700541 NPN: 80079132 ? Apply liberally to a clean and dry diaper area as needed. Keep out of reach of children. If swallowed, seek urgent medical attention or contact a poison control centre. For external use only. Avoid contact with eyes and mucous membranes; if this happens, rinse with vegetable oil. Consult a healthcare practitioner if symptoms worsen or last for more than 7 days. Do not use if allergic to plants of the marshmallow or asteraceae/compositae/daisy family. Helps treat and prevent diaper rash; protects chafed skin or minor skin irritations due to diaper rash and seals out wetness. Apply liberally as often as necessary, with each diaper change and especially at bedtime or anytime when exposure to wet diapers may be prolonged. Use this soothing blend as a preventative or a healer for diaper rash. Our baby blends are 100% natural, hypoallergenic, eco-friendly and contain no toxins, synthetics, fragrances, parabens or dyes. Breathe easy knowing that we’ve blended only ingredients that are gentle and safe for your little one. Zinc oxide—the active mineral ingredient—works to repel water while creating a safe barrier for skin to heal. Leave your baby feeling fresh, comfy and happy with this protective ingredient.